Let&apos;s be real. When you travel for work (or play) finding fit options outside of a treadmill or the predictably boring, boxed-in gym routine can be tough to come by. But with Austin&apos;s temperate climate and abundance of outdoor adventures, it&apos;s easy to get active outside the gym bag. Run, Walk or Meander the Hike-and-Bike Trail Nothing speaks to the vitality of Austin&apos;s outdoor mindset like the 10.1 mile Lady Bird Lake Hike-and-Bike Trail in the heart of downtown. Bordering Lady Bird Lake, the trail offers shaded, canopied paths and convenient mile markers for runners, walkers and cyclists. Bonus the recent opening of the Boardwalk provides a continual connection of Austin&apos;s beloved trail over the lake, not to mention spectacular views of the skyline. The glorious Barton Springs Pool. Brave a Brisk Swim at Barton Springs Pool This literal oasis attracts swimmers year-round with its spring-fed, constant 68-degree water temps. 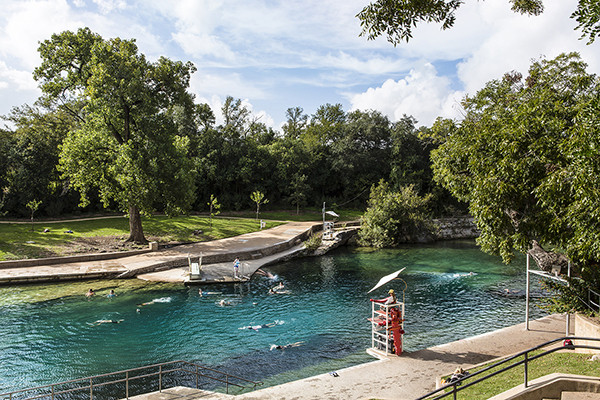 Roughly 200 meters in length, Barton Springs is perfect for both recreational and endurance swimmers alike, offering clear aquamarine waters to view native plants and fish. On warmer days, dry off by sun-bathing on the surrounding hillside. Insider tip: if you like to get your workout on early, arrive before 9 a.m. and the $3 entry fee is waived. Get Your Hike (or Bike) on at Barton Creek Greenbelt Set in the heart of Hill Country, Austin defies the expected Texas terrain. Case in point: the Barton Creek Greenbelt. Featuring more than 7 miles of hiking, biking, waterfalls and swimming holes, the greenbelt is great for families, trail runners and mountain bikers. Trail difficulty varies from easy to technical with several access points along the way. Adventurous types can even try their hand at rock-climbing in select areas. Kayak, Canoe or Paddle Board Lady Bird Lake Water activities may not be unique to Austin but the view sure is. Kayak, canoe and stand-up paddle board rental options abound on Lady Bird Lake one of the best vantage points for people, dog and bat-watching. Do as the locals do with these popular water sports and get one of the best upper-body workouts around (course, with Austin&apos;s laid-back mindset, it&apos;s not uncommon to push the oars aside and simply float the day away either). What&apos;s your favorite outdoor Austin activity? Share it with us @VisitAustinTX!